Follow the misadventures of two charismatic conmen—Harrison Floy (Michael Urie) and Mr. Pontdue (Kevin Chamberlin)—as they proceed to bamboozle Sara Longstreet (Betsy Wolfe) and her family. Their schemes incite a chase from New Brunswick, down the Jersey Shore, to Atlantic City. 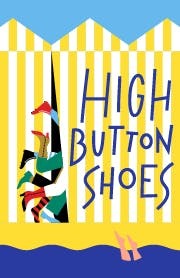 High Button Shoes also features Aidan Alberto, Jennifer Allen, Carla Duren, Chester Gregory, Mylinda Hull, Marc Koeck, Matt Loehr, and Wayne Pretlow. High Button Shoes was the first Broadway collaboration from Sammy Cahn and Jule Styne. Jerome Robbins won his first Tony Award for Best Choreography with the show and two numbers—the dazzling comedic 10-minute ensemble piece, “Bathing Beauty Ballet,” and “I Still Get Jealous”—will use his original choreography staged by Sarah O’Gleby. This Encores! production pays tribute to Robbins’s inspiring legacy in honor of the Jerome Robbins Centennial and City Center’s 75th Anniversary Season. High Button Shoes is directed by John Rando with music direction by Encores! Music Director Rob Berman and choreography by Sarah O’Gleby.